The JF-17 fighter, which was jointly developed by China and Pakistan, is set for a major upgrade, a Chinese media report said on Monday. Media reports, particularly in Pakistan, had claimed a JF-17 had shot down the MiG-21 flown by Wing Commander Abhinandan Varthaman in the recent aerial skirmish with India. Global Times, which is run by the Chinese government, reported on Monday the 'JF-17 Block 3' is expected to get an advanced active electronically scanned array (AESA) radar and a helmet-mounted sight (HMS) system. The Global Times quoted Yang Wei—who it described as the 'chief designer' of the JF-17—as saying the Block 3 variant would see upgrades to the fighter's information warfare and weapons capabilities. Yang claimed the development of new systems for the JF-17 Block 3 would run concurrent with production of the fighter in Pakistan and China. Yang claimed “a lot of countries have come to buy” the JF-17 Block 3. Nigeria and Myanmar have purchased the existing versions of the JF-17, which are designated JF-17 Block 2. Wei Dongxu, a military analyst quoted by the Global Times, said an AESA radar would enable the JF-17 to attack multiple targets, from longer range, while a helmet-mounted sight system would allow the pilot to aim weapons by merely looking at a target. Such a helmet-mounted system would give pilots an advantage in a close-range encounter with enemy jets. Dongxu claimed with the new upgrades, he expects the “JF-17 Block 3 to match an improved version of the F-16 fighter jet.” He added the proposed upgrades would also allow the JF-17 to share information with “other platforms”, hinting at the addition of a datalink system. “The JF-17 is often described by its manufacturer and military observers as an advanced but also cost-effective fighter,” the Global Times reported. 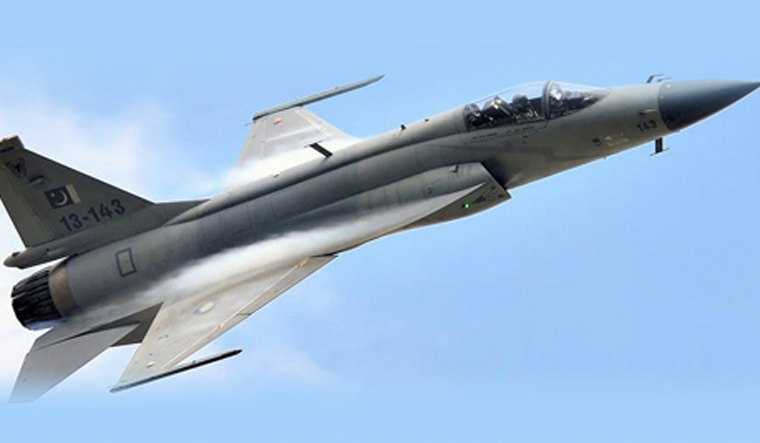 The JF-17, which uses a Russian-supplied engine, predominantly carries Chinese-origin weapons. The JF-17 is expected to gradually replace Pakistan's fleet of Chinese-built J-7 fighters (copy of the MiG-21) and ageing French-built Dassault Mirage-III/Vs. Pakistan had started production of the JF-17 in 2008 at the Pakistan Aeronautical Complex in Kamra and the first fighter was handed over in 2009. Has Sweden given Pakistan more airborne early warning radar systems? Interestingly, China does not operate the JF-17 and instead promotes it for export. Pakistan also operates over 70 F-16 fighters, purchased from the US, though restrictions on their use have meant Pakistan has been reluctant to admit to the jet's use in the recent skirmish against India. In February last year, the Pakistan Air Force had announced it had over 100 JF-17 fighters in operational service.